Yesterday you got the facts. 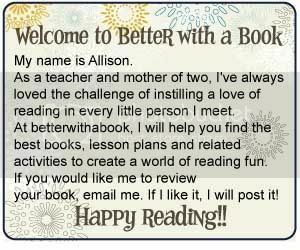 Today, take a look at some books inspired by the Olympic athletes and their efforts to go for the gold, as well as some other entertaining fictional adventures. Get your kids motivated to shoot for their own dreams! Michael Phelps and his journey to 8 gold medals. 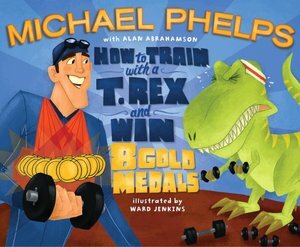 The book includes a number of analogies pertaining to the years he spent training, miles swum, calories eaten and weights lifted. Did you know that Michael Phelps swam enough miles to swim the length of the Wall of China three times? Hilarious! 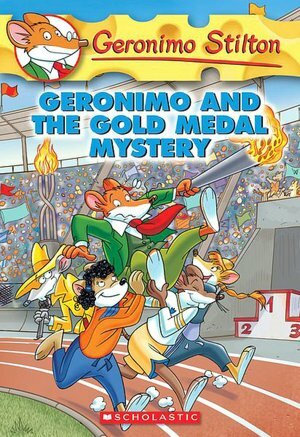 Geronimo and his friends are on a mission to find some missing gold medals in Geronimo and the Gold Medal Mystery (Geronimo Stilton, No. 33). Dream Big: Michael Jordan and the Pursuit of Olympic Gold (Paula Wiseman Books) is the story of Michael Jordan's pursuit of an Olympic gold in basketball. This is a great companion to one of my all time favorites, Salt in His Shoes: Michael Jordan in Pursuit of a Dream. In Olympig!, Boomer the pig keeps losing. At first, he brushes it off. After a while though, Boomer starts to get frustrated, but it doesn't stop him from continuing to work towards his dreams! Panda Goes to the Olympics: Animalympics is about a Panda who wants to be an Olympic runner. After that doesn't quite work out, Panda finds a better way to participate in the Olympics!